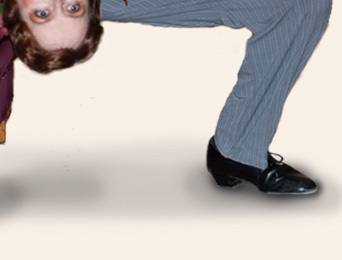 Ruth, like so many little girls, took tap and ballet lessons as a child. And, like so many little girls, hardly ever practiced and stopped going when she got old enough to realize that she was either going to have to really practice or was going to look stupid. In the fall of 1971, Ruth got involved in English country dancing through her older sister. By the following summer she'd also been sucked into the American contra dancing scene, an old New England tradition just then finding new life with a wide range of people, establishment and counter-culture alike. A year later Ruth was on stage at the National Folk Festival at Wolf Trap Farm in Virginia as part of a group of contra dancers. Gradually, Ruth moved on in life but never lost her love of dance (and she got over her aversion to practicing). She took up belly dancing in her twenties and also dabbled in the ballroom dances of earlier eras. Although Ruth first met Charles Worsley at a vintage dance in the early '80s, it wasn't until 1994 that sparks finally flew. They were married in 1999. 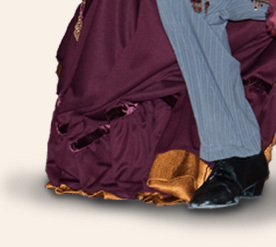 Their combined experience adds up to almost eighty years worth of dancing and includes English country dance, English ritual dance (Morris and sword), American contras and squares, Modern Western squares, Middle Eastern dance, Swing, Modern ballroom and Period Ballroom. Charles had been a modern ballroom competitor as well as a dance researcher and performer long before teaming up with Ruth. 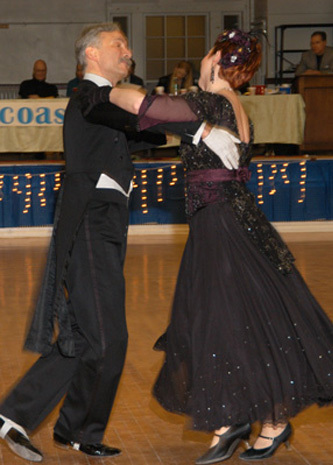 By 2001 the pair was competing together in Amateur, Champ-level Ballroom. A few years later, they switched their primary focus from competition to historic dance research and performance. For much of the next decade, Ruth and Charles choreographed their own unique "Then-to-Now" pieces. These showpieces demonstrated the original form of a ballroom dance before transitioning to the modern, competitive version. The "Then" sections were carefully researched and reconstructed from Charles' extensive library of period dance manuals and film clips; the "Now" pieces were honed and polished working with their world-renowned coach, Suzanne Hamby, as well as others. These choreographies have included an 1800's Mazurka to Viennese Waltz, a One-step & Charleston to Quickstep, a Ragtime Tango to modern Tango, Fox's Trot from 1914 to today's Foxtrot, Four Eras of Waltz: 1815, 1860, 1914, & 2008, a 1914 Maxixe to modern Samba, and a Ragtime Tango to Paso Doble to Flamenco. •	"To be simultaneously entertained and educated… You brought life to the words and danced the transition superbly. Thank you!" •	"Excellent showmanship and choreography … great partnership." •	"Super music – very dramatic. Well chosen choreography. Great costuming." •	"Beautiful job! Well rehearsed with great showmanship." •	"Great, subtle phrasing… Beautiful performance – as always…"
•	"Excellent! Done to perfection. You couldn't have fit the room and ended the day any better." These days Ruth and Charles mostly dance for fun, only occasionally offering a vintage dance performance or a tour tied to their Twirling Jennies research. They can frequently be seen dancing at one festival or another about Lowell, sometimes as performers and sometimes simply as (very happy) members of the crowd. Photo taken by Peter Alcivar. Image at upper right from photo by Moses Goddard.